This month, Gazprom Deputy Chief Executive Officer Alexander Medvedev heads to Brussels to meet with EU Competition Commissioner Margrethe Vestager as part of Gazprom’s continuing efforts to forestall an adverse EU decision on its anti-trust complaint against Gazprom’s business practices in Central and Eastern Europe. The meeting will precede the formal December 15 EU Commission hearing on the complaint, at which all interested parties are expected to be present, including European Commission and EU agency representatives, Gazprom, Gazprom’s rivals, and the complainants. Bloomberg describes the Medvedev-Verstager meeting as make-or-break for Gazprom in settling the anti-trust charges short of a penalty (potentially in the US$ billions) and a finding of illegal activity. In fact, the stakes for Gazprom in the anti-trust case are far greater than amicably settling the anti-trust charges. Without the financial contribution, its business strategy—vertical integration, market segmentation (regional and country), and oil-price indexation—traditionally has generated in Europe, it seems unlikely Gazprom will be able to finance the projects that it—and the Russian government—sees as the foundation of its future: development of Eastern Siberia’s natural gas reserves and construction of the Power of Siberia pipeline, the foundations for the 38 billion cubic meters (bcm) of natural gas Russia contracted in 2014 to sell annually to China for thirty years, starting at the end of this decade; construction of the Altai pipeline to deliver natural gas to western China from existing West Siberian natural gas fields; the Sakhalin-Khabarovsk-Vladivostok pipeline and Sakhalin LNG plant; and the Baltic LNG plant. The EU Competition Commission announced its anti-trust investigation against Gazprom’s business practices in Central and Eastern Europe on September 4, 2012. The Russian government reacted angrily. Within a week (September 9), Russian President Putin described the investigation as an EU effort to offload the cost of subsidizing East and Central European energy costs on Gazprom. He also warned that the EU would not emerge unscathed from this attack on Gazprom. On September 11, Putin followed this tough talk with a decree prohibiting strategic Russian companies such as Gazprom from disclosing information to foreign governments and disposing of assets or amending contracts without Russian government approval. 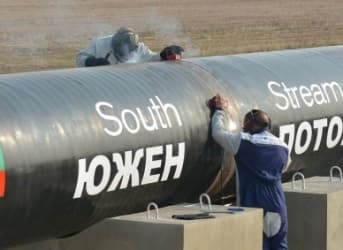 As it happened, during the three years of investigation, a number of events and trends undermined Gazprom’s position in the negotiations: the Ukrainian gas-transit and gas supply crisis, which convinced the EU to diversify away from Russian natural gas, abundant natural gas transforming the U.S. from a net importer to a potential exporter, the prospect of competition in Europe from (US) LNG, the shift in the EU away from oil-indexed prices and long-term contracts, and, starting at the end of 2014, falling crude prices. Its negotiating strength eroded, Gazprom’s approach switched from combativeness to conciliation. In September, Gazprom put forward proposals to resolve EU Commission concerns, which led to discussions between Gazprom and the EU Commission on a technical level. Reportedly, however, pricing remains a sticking point between the EU and Gazprom. Humpty Dumpty, Gazprom Heading for a Great Fall? Why are Gazprom’s global goals likely at risk? It becomes clear when analyzing Gazprom as two separate companies: Natural-Gas-Co (“N-G-O”) and Everything-Else-Co (“E-E-O”). Based on Gazprom 2014 and 1H 2015 financial reports, N-G-O generated ~95 percent of Gazprom’s gross profit (natural gas sales minus natural gas cost, or COGS) in 2013, 2014, and 1H 2015. (The 2014 financial report provides natural gas cost for 2013 and 2014, the 1H 2015 financial report combines natural gas and oil costs; therefore 1H 2015 COGS is estimated from 2014 COGS). Gazprom reports natural gas sales in three segments: Russia; Europe and Other Countries, which includes (so far modest) LNG sales; and Former Soviet Union (FSU) countries. Europe is Gazprom’s second largest natural gas market in volume terms, after Russia itself, with a ~36 percent share from 2013 through 1H 2015. Europe also generates the bulk of Gazprom’s Profit (loss) from sales—i.e., after deducting sales and general administrative expenses (SG&A) in Gazprom’s income statement: ~90 percent in 2013 and 2014 and nearly 100 percent in 1H 2015 (SG&A allocated to regions by physical volume share). The EU anti-trust complaint objects to Gazprom’s practice of indexing natural gas prices to oil prices (and adjusting to changes in oil prices with a lag) rather than linking them to natural gas market prices—natural gas market spot prices that reflect natural gas market dynamics (including in theory and practice natural gas production and transport costs). In fact, Gazprom’s COGs in 2013 and 2014 were roughly equal to Henry Hub prices as quoted in MM/Btu on the CME through 2020. Henry Hub prices remain below $3.00/MMBtu through 2017 and from 2017 rise above $3.00/MMBtu only in winter months, and then no more than $0.10 in 2018, $0.20 in 2019, and $0.35 in 2020. The IEA estimated in its Medium Term Market Report 2015 for natural gas that Gazprom’s exports to the EU will be capped at ~160 BCM annually through 2020 (which, of course, Gazprom opposes). It attributes this to several factors, including the EU’s determination to minimize dependence on Russia, the prospect of U.S. LNG (estimated at ~66 BCM added annually to global LNG supplies), greater use of renewables, and efficiency gains. Assuming, a margin of $1.50/MMBtu, the landed Cheniere LNG price in Europe would be $165.75/1000 M3, essentially equal to Gazprom’s average net price to Europe in Q2 2015 ($164.47).The following table shows that at $165.75/1000 M3 and 160 BCM annual sales volume, Gazprom’s revenues net of COGS and SGA from sales to its most lucrative market, Europe & OC, would be far less than the ~$35 billion it received in 2013 and 2014. In other words, if natural gas market dynamics determine natural gas prices in Europe in the future, rather than crude prices, Gazprom will not be able to depend on its European natural gas sales to fund its investment projects. Several significant contradictions are embedded in the foundation of the EU-Russian natural gas relationship. Gazprom has depended on its natural gas sales to Europe to finance its development projects. With the exception of Baltic LNG (and pipeline projects like Nordstream 2, which EU officials say are superfluous), Europe will derive little or no benefit from them. In fact, Russian government officials described Power of Siberia as an opportunity to free Gazprom (and Russia) from its dependence on Europe in the natural gas trade (and may have refused to disclose the price at which Gazprom will supply natural gas to China to hide the fact that they expected Gazprom’s European revenues fund the project—at the time, prices were above $350/1000 M3). In addition, Russian commentators have described the Altai pipeline project (which will draw natural gas from the same West Siberian natural gas fields that supply Europe) as giving Russia leverage over Europe in future natural gas negotiations. Long-term contracts that require volume and (inflexible) price commitments, the foundation of Gazprom’s business practices in Europe, are disadvantageous to Gazprom’s European customers. First, if Gazprom prices are higher than market prices, Gazprom absorbs the funds customers otherwise could use to develop alternatives to Gazprom natural gas. Second, customers are subject to political risk—Russia has demonstrated its willingness to use natural gas as a weapon in political disputes. For the EU, the implications of these contradictions are clear: it should insist on natural gas prices that reflect natural gas market dynamics (and production costs) and flexible supply arrangements. For Gazprom, the implications also are clear: it needs to seek new sources to finance its development projects.